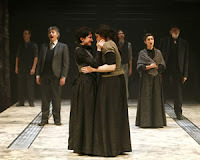 Won two free tickets to the world premier of the new Australian musical drama called The Hatpin via an SMS competition. On the day of the show, I went to the Seymour Theatre box office to claim my tickets. Unfortunately, they can't find my name on the list. My sister's not gonna like it if she has to drive all the way from Macquarie for nothing. Then, I remembered - I actually used an alias for the competition because I didn't like giving out personal details. Good thing the lady gave me the tickets without asking for identification. 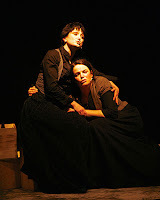 The Hatpin is based on a true story about the practise of "baby-farming" in 19th-century Australia. At that time, contraception and adoption was not yet in vouge and ladies who have children out of wedlock have no option but to give up their babies to certain parties who will care for the babies for a fee and hopefully find a new home for them. Unfortunately, some unscrupulous baby-farmers find it easier to simply kill off the babies, rather than find foster parents for them. If they play their cards right, they can still keep on collecting money from the mothers. Even when exposed as fraudsters, these baby-farmers are usually safe from the law because the mothers are too frightened or ashamed to go to the police. In the play, Amber Murray (Melle Stewart) advertised her baby Horace in a newspaper trading column. The Makins came around to get the baby, but never allowed Amber to see her baby again. The Makins eventually moved house. Amber and her friend Harriet Piper (Caroline O'Connor) managed to track down the bad guys, and bring them to court. In the courtroom climax, Clara Makin revealed how her parents would use a hatpin to kill an unwanted baby, and bury it in the backyard. Hard to imagine that people will actually kill innocent babies for monetary gain.